The May Big Game of Mission command has been and gone. Alan is writing some after action reports and rather then reproduce them here, I’m going to link to them so he gets some traffic to his site. Photos from the day can be found on Flickr. Thanks to everyone who turned up and made it a great day. Until the next time. July 1st 1863, Pennsylvania …. Unfortunately I won’t be present this time as I am back on the Isle of Wight hacking dinosaurs, but hopefully everyone who does attend will have a great time… and take lots of pictures! So our next big game in on Saturday May 7 and sees us once again returning to Normandy 1944 with Mission Command. The scenario this time will be a psuedo-historical affair, so that reading up on the history won’t be relevant. Set around Caen it will pit the Canadians against the Germans. Alan has put some more details on his blog, so I’m not going to repeat them here. I have offered to help umpire, as well as take lots of photos. I’m looking forward to being able to see the whole game unfold. Hopefully there will be lots to report afterwards. There are currently eight players signed up, but there is definitely room for more, so if you want to take part, please do let us know. Look forward to seeing everyone on the 7th. Friday Drop-in Game nights have been changed to show a start time of 6pm. Friday, April 15 – Mark will be running a WWII naval game using Victory at Sea. 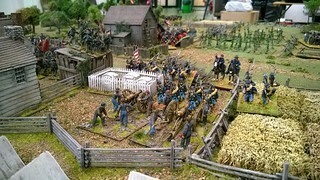 Saturday, June 4 – now confirmed as an American Civil War game in 28mm. Saturday, August 6 – Zulu War in 28mm, apparently with a twist! As always, the full calendar can be accessed via the Calendar page or subscribed to with your calendar app of choice. If anyone want’s anything added or changed on the calendar, just email me the details and I’ll take of it. 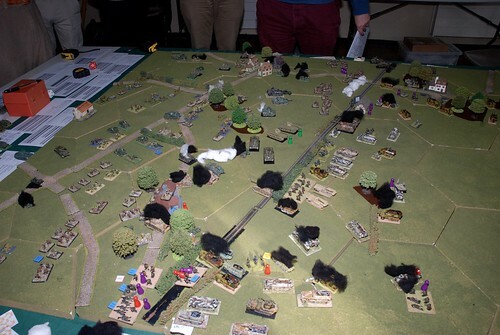 On Saturday 5th March 2016 the planned game is an Ancient Wargames Campaign. The campaign will be fought over the “Frome Peninsula” map. This is a hex map and players will need to maneuver over it to achieve their campaign objectives. Each player’s objective will be to obtain as many Victory points as possible in the course of the campaign, by capturing cities and towns, winning battles, and obtaining and retaining treasury funds in the form of Supply Points (SP). The campaign rules are available as a PDF. Each player will start the campaign commanding an army of 100 army points (based on a simplified DBM 3.3 points list, adapted to cover the DBA element types). In addition, they will control a ‘city’ (settlement with a wall on the map) and three local ‘towns’ (small settlement with no wall). Each 100AP Army Command will conform to a DBM100 / DBMM 100 army list. Instead of using the DBM3.3 rules to resolve battles, we have chosen instead for simplicity to use the DBA 3.0 rules, but to make the army commands larger (similar to DBM 100). DBA purists may regard this as sacrilege, but we are experimenting and seeing if we can get a different feel to the standard DBA ‘nodal’ campaign and 12 element armies format. For simplicity a DBA 3.0 quick reference sheet is available. Join us on the day to see how things work out! Today I’ve created both Flickr and Twitter accounts for The Abbeywood Irregulars. Flickr is so that photos can be easily shared and linked to from the website and Twitter as another way to get news about the groups activities out to a wider audience. There is also a Flickr Group at https://www.flickr.com/groups/abbeywoodirregulars/, for anyone who already has a Flickr account to add photos to, rather than have them re-uploaded to the group’s account. So last Saturday, January 2, saw The Abbeywood Irregulars gather for their first meeting of the new year. It was a very relaxed affair with no real plan except for some games to be played and mince pies consumed. There had also been talk of mulled wine. Of these, Airfix Battles was the most played. This was a playtest version of the game that will be released later this year by Modiphius Entertainment. Thanks to Alan for bringing it along for us to try out. I know it garnered a number of positive comments and suspect it may well be making a regular appearance once it is released. Alan has written a blog post discussing the day’s games. I don’t think any photos were taken on the day, but if they were, I’ll update this post with some links. 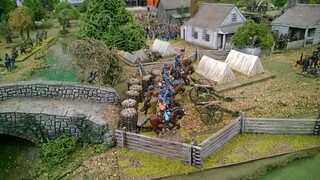 Next up it’s 15mm Napoleonic (Northern Wars) on Saturday, February 6. More details to (hopefully) follow. As the title says, welcome to the Abbeywood Irregulars website. Admittedly there isn’t much to see right now, but hopefully that will soon change. For information about the group and it’s history, check out the About page and for dates of forthcoming games, the Calendar page or even subscribe to the Google Calendar. If you want to find out more, please don’t hesitate to contact us at (contact@abbeywoodirregulars.uk).